Our July employee spotlight shines a bright light on Carma Pulawski, executive assistant for the Easter Seals VIP Academy. 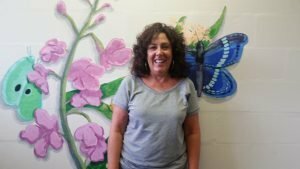 Carma has been part of the ES family for six years and works alongside Don Herndon, Director of Adult Services and VIP. Carma helps to ensure that Easter Seals programs are complying with DOE (Department of Education) standards while also acting as a liaison between parents and the school board. Before joining Easter Seals Carma worked as a clerical assistant for the Manatee County School Board. When asked what her favorite part about working at Easter Seals is, Carma said “I have a chance every day to make a difference in someone’s life.” Well Carma, you make a difference in our lives too. When she’s not busy playing “wing woman” to Don, Carma loves to relax with a good book or a walk on the beach. In 10 years she hope to retire right here in Sarasota.